The transforming growth fac or beta (TGF-β) superfamily is a large family of growth factors named after the first member TGF-β1. Members of TGF-β superfamily are similar in structure. TGF-β superfamily distributes in invertebrates as well as vertebrates species. They play role in dorso-ventral patterning, mesoderm induction and patterning, and also in limb bud formation, bone and cartilage formation, neuron differentiation. So TGF-β superfamily is important in development of a variety of different tissues and organs. The transforming growth factor-β (TGF-β) superfamily is a family of proteins that is involved in regulating and mediating processes at the cellular level, including cell proliferation, differentiation, motility, adhesion and apoptosis, as well as processes at the tissue and organism level, including development, wound healing, fibrosis and angiogenesis. The TGF-β superfamily consists of ligands and receptors that all signal, at least in part, through well characterized downstream mediators termed the Smads. The TGF-β1 ligand is the founding member of the TGF-β superfamily of proteins that includes TGF-βs, bone morphogenetic proteins (BMPs), activins, growth differentiation factors (GDFs), activin/inhibin subfamily, Glial-derived Neurotrophic Factors (GDNFs) and Müllerian inhibiting substance (MIS). TGF-β1 and all other TGF-β superfamily ligands are dimers that are held together by three disulfide bonds that are part of a characteristic structure called a cysteine knot. Secreted TGF-β is a latent complex that is composed of the TGF-β dimer associated with the latency associated peptide (LAP) and the latent TGF-β binding protein (LTBP). The latent complex is proteolytically cleaved in the extracellular space resulting in the release of the TGF-β dimer, allowing TGF-β to bind cell surface receptors. The cell surface TGF-β superfamily receptors are classified as either type I receptors, type II receptors, or co-receptors. In mammals, there are seven type I TGF-β superfamily receptors called activing receptor like kinases (ALK) 1-7 in the TGF-β superfamily. 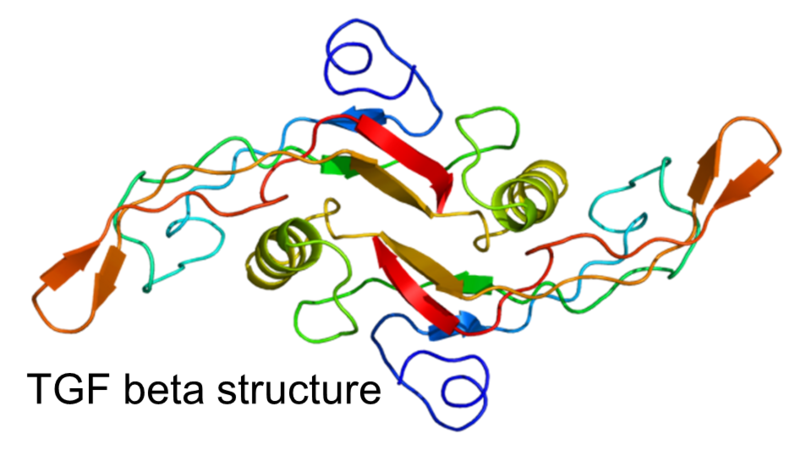 The ALKs are approximately 55 kD, are serine/threonine kinases, and have relatively short extracellular domains. The cytoplasmic domain of the type I receptors has a 30 amino acid domain named the GS domain, which is characterized by the sequence SGSGSG. Phosphorylation of the GS domain by the TGF-β superfamily type II receptors results in activation of the type I receptors. Downstream of the GS domain is the kinase domain, which phosphorylates its substrates on serines. Within the kinase domains of type I receptors, there is a region called the L45 loop, which is involved in substrate recognition. There are five type II receptors in the TGF-β superfamily, the TGF-β type II receptor (TβRII), Activin type II receptor (ActRII), Activin type II receptor B (ActRIIB), BMP type II receptor (BMPRII), and anti-Müllerian hormone receptor (AMHR). These receptors are approximately 70 kDa, are serine/threonine kinases, have short extracellular domains and autophosphorylate and phosphorylate the type I receptors on serines and threonines. The regulatory region of the type II receptors has two serines that when phosphorylated promote or inhibit the activity of the type II receptors. In the TGF-β superfamily there are also co- receptors, the type III TGF-β receptor (TβRIII), endoglin, RGMa, DRAGON (RGMb), and hemojuvelin/HFE2 (RGMc). TβRIII and endoglin are transmembrane co-receptors, while RGMa, RGMb, and RGMc lack transmembrane domains and are glycosylphosphatidylinositol (GPI)-linked to the cell membrane and all possess a large extracellular domain. The cytoplasmic domains of the transmembrane co-receptors, TβRIII and endoglin, are serine/threonine rich, have a PDZ binding domain, and lack catalytic activity. During human development, homeostasis is maintained across the embryo's rapidly expanding networks of tissues and organ systems through carefully balanced molecular signaling pathways. For example, BMP4, a member of the superfamily, is active during early inner cell mass proliferation, and later in development among neural, bone and dermal cell types. Other family members are involved in left-right axis symmetry and asymmetry formation, vascular development, and in cardiac, lung, craniofacial, and urogenital development. Mutations in these critical TGF-β systems, whether in the genes encoding the cytokines, their receptors, or members of the downstream intercellular signaling pathways, are responsible for a wide spectrum of developmental disorders, as well as many adult disease states. TGF-beta signaling not only acts as a tumor suppressor, but has been shown, in vitro and in vivo, to act as a powerful stimulator of tumor progression. 1. Herpin A, Lelong C, Favrel P. Transforming growth factor-β-related proteins: an ancestral and widespread superfamily of cytokines in metazoans[J]. Developmental & Comparative Immunology, 2004, 28(5): 461-485. 2. Massagué J. TGF-β signal transduction[J]. Annual review of biochemistry, 1998, 67(1): 753-791. 3. Gordon K J, Blobe G C. Role of transforming growth factor-β superfamily signaling pathways in human disease[J]. Biochimica et Biophysica Acta (BBA)-Molecular Basis of Disease, 2008, 1782(4): 197-228. 4. Dong M, How T, Kirkbride K C, et al. The type III TGF-β receptor suppresses breast cancer progression[J]. Journal of Clinical Investigation, 2007, 117(1): 206.